Wednesday- January 23rd, AFC is looking for 3 new cage girls to join our team and win a 1 year contract! It is easy to enter! 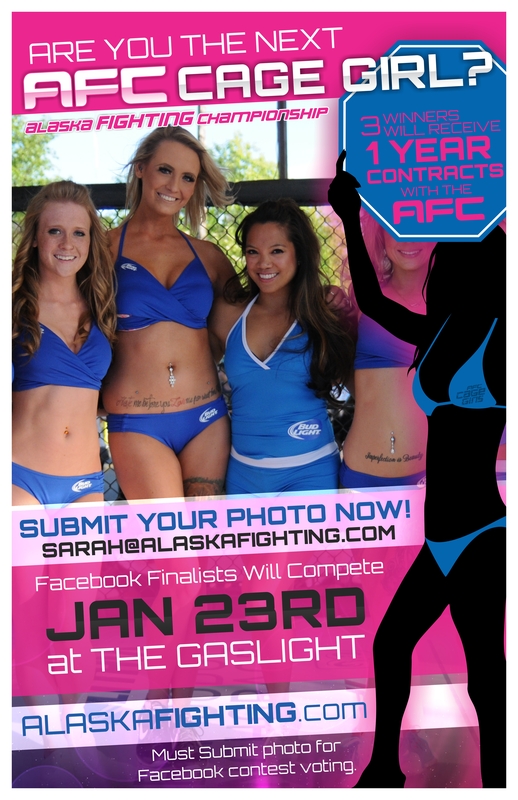 All you have to do is email one photo to sarah@alaskafighting.com. ALL CONTESTANTS will compete LIVE at The Gaslight Jan. 23rd. You will be judged on 4 areas Photo (Facebook contest), Q & A , swimwear and club wear. Please message AFC Sarah with any questions about the contest. You must be 21 or older to enter. This is a free event any open to the public! We will be giving away FREE AFC 145 tickets and tons of prizes from K&L Distributors and MODELO! Special thanks to Color Me Tan for sponsoring the AFC Cage Girls !